The Federal Reserve has not followed the suggestion of some that it pursue a monetary policy strategy aimed at pushing up longer-run inflation expectations. In theory, such an approach could reduce real interest rates and so stimulate spending and output. However, that theoretical argument ignores the risk that such a policy could cause the public to lose confidence in the central bank’s willingness to resist further upward shifts in inflation, and so undermine the effectiveness of monetary policy going forward. The anchoring of inflation expectations is a hard-won success that has been achieved over the course of three decades, and this stability cannot be taken for granted. 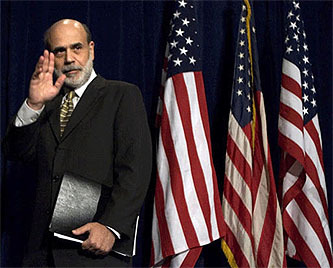 I think this demonstrates pretty well why it’s entirely possible to say both (a) Bernanke’s background made him extremely well suited to play a crisis management role in 2007-08 and he did a good job at it, but (b) he’s not the right guy to lead the Fed going forward. What we’re likely to need over the next few years isn’t a crisis manager, but someone who unwinds the Fed’s position gradually and takes its role in boosting employment more seriously. But Bernanke is a mainstream conservative, and mainstream conservatives have always been more concerned with inflation than with unemployment. This was entirely predictable, and it’s why, even though he did a creditable job in his first term, he shouldn’t have gotten a second.